The Audi A6 is an executive car made by the German automaker Audi, now in its fifth generation. 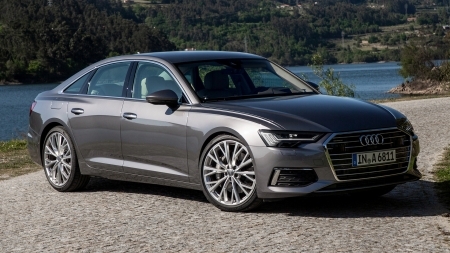 As the successor to the Audi 100, the A6 is manufactured in Neckarsulm, Germany – and is available in sedan and wagon configurations, the latter marketed by Audi as the Avant. Audi's internal numbering treats the A6 as a continuation of the Audi 100 lineage, with the initial A6 designated as a member of the C4-series, followed by the C5, C6,C7 and the C8. The related Audi A7 is essentially a sportback (fastback) version of the C7-series and C8 - series A6, but is marketed under its own separate identity and model designation. Both petrol and diesel versions of the A6 are supplied. A wide range of engines make power units with a capacity of 150 to 333 horsepower. These are inline 4-cylinder 16-valve turbocharged engines and more powerful 3-litre units in a V6 configuration with a mechanical compressor. Marco_Ghostly Uploaded by Marco_Ghostly on Sep 18, 2018 . 2018 Audi A6 - Desktop Nexus Cars Download free wallpapers and background images: 2018 Audi A6. Desktop Nexus Cars background ID 2421341. The Audi A6 is an executive car made by the German automaker Audi, now in its fifth generation. As the successor to the Audi 100, the A6 is manufactured in Neckarsulm, Germany – and is available in sedan and wagon configurations, the latter marketed by Audi as the Avant. Audi's internal numbering treats the A6 as a continuation of the Audi 100 lineage, with the initial A6 designated as a member of the C4-series, followed by the C5, C6,C7 and the C8. The related Audi A7 is essentially a sportback (fastback) version of the C7-series and C8 - series A6, but is marketed under its own separate identity and model designation.